Coming this weekend…. 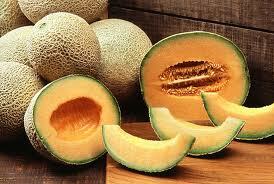 fresh homegrown local cantaloupes, the first of the season, DELICIOUS! Stop by and pick some up for your holiday gatherings at the New Albany Farmer’s Market on Saturday. We will be under the pavilion on the corner of Market & Bank streets in BEAUTIFUL downtown New Albany from 8-1! While you beat the heat this weekend you could try your hand at creating this lovely dessert plate for your holiday guest! Pick up your fresh ingredients at the New Albany Farmer’s Market this weekend! 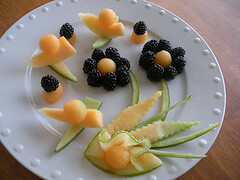 Fresh blackberries and cantaloupe are all you need, plus a lot of time and patience! Gorgeous !